Australia’s involvement in Vietnam was driven by a fear of communist expansion in Asia and a desire to align with the United States. Even after its federation and nominal independence in 1901, Australia’s foreign policy was for years strongly influenced by Britain. Prior to World War II, the Australian government still looked to London for leadership, diplomatic guidance and, when necessary, military protection. This reliance was undermined by the events of World War II. The advance of Japanese imperial forces into the Asia-Pacific brought an aggressive imperial power close to Australia’s shores. Australian confidence was particularly rattled by three events, all in February 1942: the surrender of the British base at Singapore, the Japanese invasion of New Guinea and the bombing of Darwin by Japanese planes. It became apparent that Britain was incapable and perhaps unwilling to assist with the defence of Australia. This prompted the Australian government, then led by prime minister John Curtin, to initiate a fundamental shift in Australian foreign policy. 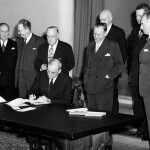 Without cutting its ties with Britain, Canberra began to draw closer to the United States, now a more formidable power in the Pacific region. In April 1942, Curtin placed all Australian military units under the command of an American general, Douglas Macarthur. American troops were extensively based in Australia for the duration of World War II. This close co-operation continued after the war. 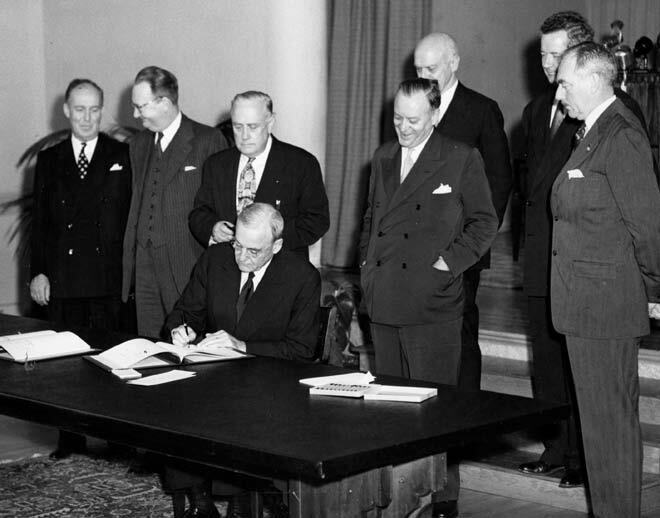 In 1951 Australia, New Zealand and the US signed the ANZUS treaty, a military alliance developed largely in response to Cold War threats, such as the rise of communist China. Under the terms of ANZUS, if one of the three signatories was attacked for a foreign power, the others were required to assist. Like its new ally America, Australia had also been subject to anti-communist scares and hysteria. The Communist Party of Australia (CPA), formed in 1920, had been banned during World War II. Though its membership was never large, the CPA was a prominent and outspoken group. In the late 1940s, a period of social and economic unrest, Australia was disrupted by several major strikes. The conservative press and politicians blamed these strikes on the CPA, which they blamed for industrial destabilisation. Robert Menzies, then leader of Australia’s opposition party, played up this communist threat. 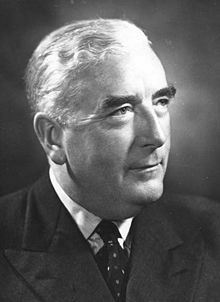 Menzies claimed that trade unions and the Labor Party, then Australia’s party of government, had been infiltrated by communist agents and agitators. 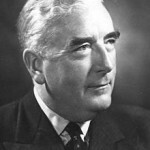 In December 1949 Menzies became prime minister after a decisive election victory. The following year he attempted to ban the CPA, declaring it an illegal organisation. Menzies’ banning of the CPA was later declared unconstitutional by the High Court, then blocked by a nationwide referendum. 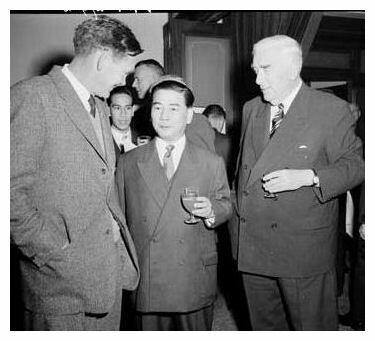 Through the 1950s Menzies’ government attempted to assert Australia’s importance in the Asia-Pacific region. It also sought to maintain and strengthen its wartime ties with the US. In 1954 Australia became a foundation member of the South-East Asia Treaty Organisation (SEATO). A multilateral body for collective defence against communist aggression, SEATO was effectively an ‘Asian NATO’. Like other SEATO nations, Australia gave its full and unequivocal support for the newly formed Republic of South Vietnam. In late 1956 Australia began supplying aid to Asian nations under SEATO protection. The first package was in the region of three million pounds, the largest portion of which went to Saigon. 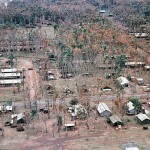 This aid package received widespread support in Australia, both from the general population and both sides of politics. Australia continued supplying financial aid and equipment to South Vietnam and other SEATO protectorates. By the end of 1965, Canberra had remitted the equivalent of $US13 million in aid. Australian military involvement in Vietnam began in August 1962 when 30 training personnel were sent to assist the South Vietnamese Army (ARVN). In June 1963 Sergeant William Hacking became the first Australian serviceman to die in Vietnam, after an accidental weapon discharge. 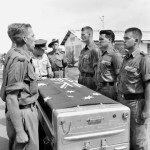 In July 1964 Warrant Officer Kevin Conway became the first Australian to be killed in action in Vietnam after a US camp was attacked with mortars and overrun by Viet Cong soldiers. Despite these losses, the Menzies government remained committed to assisting South Vietnam for up to ten years – but this support, they said, would remain focused on training and logistics. The Gulf of Tonkin incident and the direct involvement of US troops caused a shift in Australia’s position. In November 1964 Menzies told Australians that the build-up of communist forces and increases in attacks by communist insurgents required a stronger response in Vietnam. Menzies announced the introduction of a National Service scheme – in effect a form of conscription – where males over the age of 20 would be selected by a ‘birthday ballot’. These conscripts would serve a minimum of two years with the Australian Army, during which time they may be deployed in Vietnam. Menzies hoped to raise 8,000 troops each year via the National Service program. In April 1965 Menzies announced the dispatch of the first Australian combat troops to Vietnam. Opinion polling suggests a significant majority of Australians supported this decision. Menzies retired from politics in early 1966, aged 72, and was replaced by his deputy leader Harold Holt. In June 1966 Holt visited Washington DC and held talks with US president Lyndon Johnson and other American political and military leaders. Holt announced publicly that Australia would “go all the way with LBJ”. Lyndon Johnson embarked on a reciprocal visit in October 1966, the first visit to Australia by a serving US president. Johnson was welcomed in Australia by enormous crowds. More than 300,000 people gathered along the president’s motorcade in Melbourne. Johnson’s visit to Australia did encounter some small but visible anti-war protests. For the most part, it seemed the US-Australian alliance had never been stronger. The events of late 1967 and 1968 undermined Australian support for Lyndon Johnson and the war in Vietnam. In December 1967 prime minister Harold Holt disappeared while swimming at Portsea; Holt was never found and he was presumed drowned. 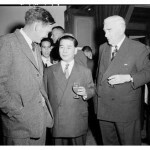 His successor, John Gorton, was an Air Force fighter pilot who supported Australian military involvement in Vietnam. Gorton, however, was more sceptical about how the Vietnam War was being fought and America’s military objectives in Vietnam. The Tet Offensive in early 1968 eroded Australia’s confidence about the progress of the war. Gorton became increasingly concerned about the lack of consultation between Washington and Canberra. In March 1968, when Lyndon Johnson halted the bombing of North Vietnam and announced his decision not to stand for re-election, Gorton only found out from media reports. In private he expressed the view that this was no way to treat an ally. Around 60,000 Australian military personnel served in Vietnam during the course of the war. There were never more than 7,700 Australian combat troops deployed in Vietnam at any one time. 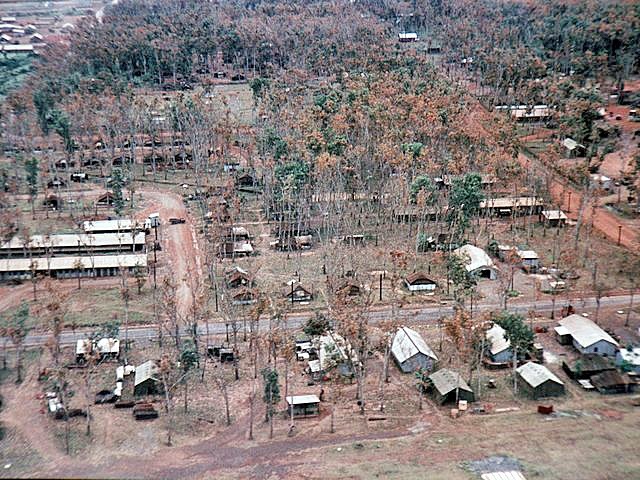 In 1966 Australian forces were given responsibility for Phuoc Tuy province, 50 miles east of Saigon. They constructed an airstrip and major base at Nui Dat, then worked to clear the surrounding area of Viet Cong. Australian military tactics tended to be more cautious and measured than those employed by their American allies. Australians operated in smaller units, usually platoons. They used counter-insurgency tactics and avoided major roads, paths and obvious ambush points. These methods made Australian troops more effective and more respected by their enemy, though impatient US commanders sometimes criticised the Australians for not clearing areas quickly enough. A total of 521 Australian servicemen were killed in action in Vietnam. 1. Prior to World War II, Australia’s foreign policy was strongly influenced by Britain. This changed during and after the war, when Canberra sought closer defence ties with the United States. 2. Australian society and politics was also affected by Cold War paranoia. Australians feared infiltration of unions and political parties by communists, as well as communist expansion in Asia. 3. Closer ties with the US were established in the 1950s. The Menzies government signed the ANZUS treaty, joined SEATO and provided financial aid and support to South Vietnam. 4. Australia sent a contingent of military trainers to Vietnam in 1962. 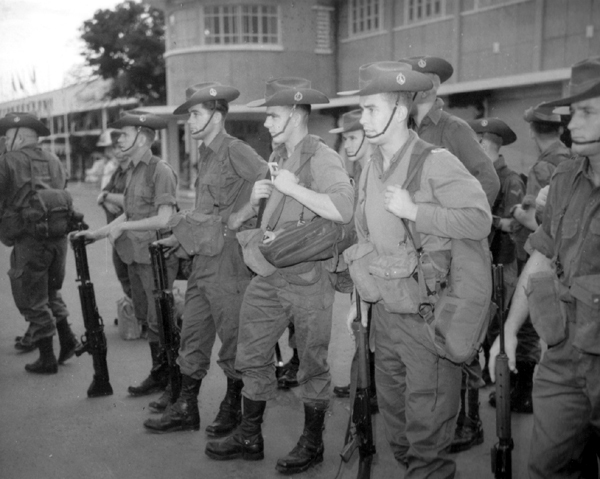 In 1964 Canberra introduced conscription to increase its defence force. 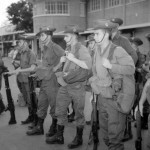 Australian combat troops to sent to Vietnam in 1965. 5. Australia’s commitment to Vietnam remained relatively small, with around 60,000 soldiers serving there during the conflict. Australian troops were mostly based in the southern province of Phuoc Tuy. J. Llewellyn et al, “Australian involvement in Vietnam”, Alpha History, accessed [today’s date], https://alphahistory.com/vietnamwar/australian-involvement-in-vietnam/.